There are tons of variables to take into account when choosing the right outdoor movie projector for your outdoor theater system. You can’t just use any old home theater projector for your large outdoor movie event, so where do you start when looking for the perfect projector? Before you pick your outdoor movie projector, you must start with your outdoor movie screen. The projector you use varies greatly depending on the size of the screen. 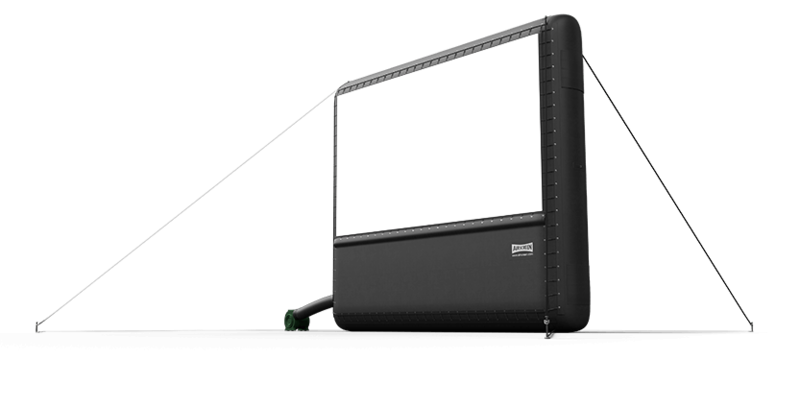 A common screen for an audience of 500 people is the 20′ x 11′ AIRSCREEN Aeropro. For this AIRSCREEN model, we suggest a projector with a minimum of 4,700 lumens like the Optoma EH500. A brighter projector can be used with a screen this size, but you don’t want to go too bright and leave your audience members shielding their eyes. You then need to ask yourself how much ambient light there is at your outdoor movie site. Areas with more ambient light, say, from streetlights, require more lumens. Other light is competing with the light from the projector, so you need to increase the brightness to reach the highest quality picture. It is also important to know the distance your projection booth is from your outdoor movie screen. At Outdoor Movies, we always strive to place the booth behind the audience for unobstructed viewing. However, projectors with lower lumens may not be bright enough to provide a decent quality picture from the back of the crowd. All of these factors, and many more, are taken into account when you speak with our engineers about which projector is right for you. Have questions about whether your outdoor movie projector is bright enough for your purposes? Contact us today!